1.) 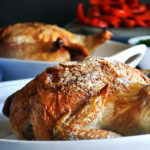 Perfect Roast Chicken with Sautéed Green Beans, and Red Peppers 2.) 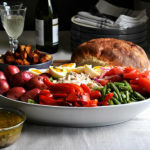 Chicken Salad Niçoise 3.) Chicken Enchilada Bake with Black Beans 4.) Tortilla Soup 5.) Stuffed Poblano Peppers. If you’re not familiar with this blog, here’s the basic idea behind each weekly meal plan: A little advance planning and meal prep work every day is the key to getting delicious, wholesome, good for you, home cooked meals on the table several nights of the week. A little = a lot. Roast one, two, or more chickens, depending on how many people you’re cooking for this week. For a family of four, roast 2 chickens. Eat one for dinner tonight and save the meat from the second chicken for Chicken Salad Niçoise, chicken enchiladas, and tortilla soup. Sauté green beans and red peppers: For a family of 4, sauté 6 red peppers and 1 – 2 lbs of green beans. Serve half for dinner tonight and reserve the rest for tomorrow night’s Chicken Salad Niçoise. After dinner, pick all leftover chicken from the bones, divide into 3 portions, and put each portion in a separate zip-top bag. Use chicken bones to make ultra simple chicken broth, letting it simmer on the stovetop or in the slow cooker overnight. Wrap and reserve leftover French bread. If you really want to get a jump on the week, go ahead and make the dressing and the croutons for Chicken Salad Niçoise, and the black beans that will be served with chicken enchilada bake, and used in tortilla soup and stuffed poblano peppers later in the week. In the morning, strain bones from the chicken broth that’s been simmering away on your stovetop all night and store in the refrigerator in a covered container. Use some (or all) of last night’s leftover bread to make homemade croutons. Make Chicken Salad Niçoise using the reserved green beans and red peppers that you sautéed yesterday and 1/3 of the leftover roast chicken. 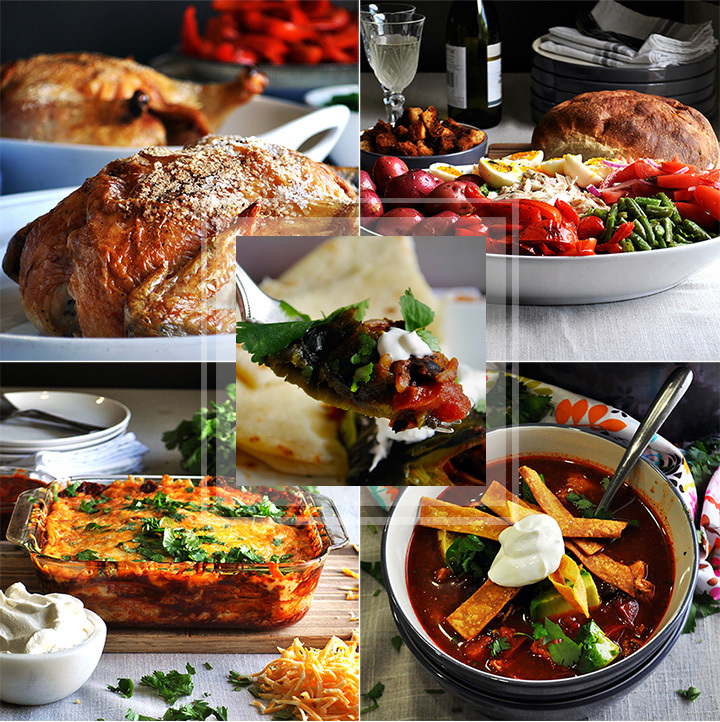 What’s for Dinner Tonight: Chicken Enchilada Bake with Black Beans. In the morning, get the black beans cooking in a pot on the stovetop or in the slow cooker (instructions for both are in the recipe). 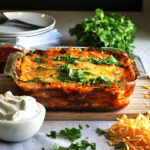 Make chicken enchilada bake using some of the chicken broth you prepared earlier in the week and 1/3 of the leftover chicken meat. *NOTE: Using chicken in the enchilada bake is optional. This dish is wonderful with just cheese. So, if you don’t have enough leftover chicken, or you’d rather do something else with it, don’t worry about it. Reserve leftover corn tortillas for tortilla soup. Reserve 1 1/4 cups of the enchilada sauce in two portions: 1 cup for tortilla soup and ¼ cup for stuffed poblanos peppers. Reserve leftover black beans in two portions: 2 cups for stuffed peppers and 1 – 2 cups for tortilla soup. 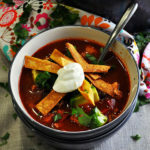 Make tortilla soup using leftover chicken broth, corn tortillas, 1/3 of the chicken, 1 cup reserved enchilada sauce, and 1-2 cups of black beans. 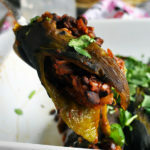 Make stuffed Poblano peppers using reserved 2 cups of black beans and reserved ¼ cup enchilada sauce. *NOTE: If you want to get a jump start on these early in the day, roast the poblano peppers in the morning, placing them in a bowl covered with a towel on the kitchen counter, and leaving them there for the day. Then, that evening, peel off their blackened skins and proceed with the recipe. Homemade flour tortillas are especially delicious alongside Stuffed Poblano Peppers.